My fabulous birthday surprise a Laurel Burch handbag from all of my girlfriends at work. They all knew of my preference for Laurel’s work and pick one of the purses I had not obtained yet. They had already seen many of the ones I have including the cross body bag with the multi colored feline face on it. It was one of the first purses i took to work. Today I received the wonderful Canine Family bag. This is a medium sized hand bag that has an entire canine family on the side including all 5 members. The main color is a light blue but there is also has green, yellow, pink, red and darker shades of blue. The inside of the bad is roomy enough I can place my essential in it without being weighted down too much. Since this is a Laurel Burch original, there are other bags and totes that f0llow this same canine theme. In total there are three of this theme but some designs have up to 5 different types of bags. When I have all of them, I can then chose just which one is perfect for the occasion, and amount of items I need to have with me while still carrying the theme purse of my choice. 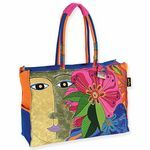 Another very important factor in having Laurel Burch designed accessories is not only is there multiple purses and hand bags following the same theme, but other items as well. For the Canine Family handbag, there is also a wonderful and soft silk scarf. It is a foot wide and 4 ½ feet long. I can wear it around my neck or on my head. Both places will help accent the hand bag I have just received. While most of the Laurel Burch designed accessories do have a feline theme, this one was canine. This variation of her colorful designs matched with my personality. While I am a cat person, I also love dogs and most other animals. This is what is so great about the abundance of designs Laurel made. She does have a majority of them with felines, because they are so soft and cuddly, but other animals are included from her happy place. The girls at the office know the reason I prefer accessories from Laurel Burch. She is my inspiration to keep going with a positive attitude. Knowing that she lived her life in agonizing pain but still managed to place a smile on her face every day helps but my feeble little problems into proper perspective. All I need to do is glance at this new hand bag, or any other accessory from Laurel and I am reminded of this inspiration. I thank the girls at the office over and over again for the wonderful and up lifting gift they gave me. While I did receive many gifts on that birthday, it was the Laurel Burch handbag that I will never forget and always cherish.